In the past decade, two new sculpture materials, Lucite and Kalonite, were introduced to the world of art. Lucite is a clear acrylic monomer and Kalonite is a transparent polymer whose color ranges from a soft rose to a vibrant amethyst. Wyland's acrylics are made of Kalonite. Proprietary chemical formations, not pigmentation, give this substance its gem-like quality, with color variations that are similar to translucent materials found in nature. Light flows through the sculpture for a delightful diffused effect that can be enhanced with special lighting techniques. Studio lighting or sunlight can be used to accentuate shadows and draw the eye to other unique characteristics within the piece. Derived from the Greek word meaning "to perceive," aesthetics is the philosophy behind art. Aesthetic criticism seeks to formulate non-subjective laws and criteria to account for human perception of beauty and taste. Artagraphy is considered the state of the art in fine art reproduction. The following three-step artagraphic process recreates the color and three-dimensional surface texture of an original oil painting: First, the exact colors of the original are scanned by a digital laser with an advanced optical system. Each color is printed one at a time using oil-based inks in overlapping layers onto a unique oil-based sheet. Next, a mold is made from the original painting to recreate the surface texture and brushstrokes in bas-relief. A patented silicon gel substance is poured onto the bas-relief and 72 hours later the mold is removed to create the negative mold. Finally, all the elements Ñ the negative mold, the printed oil-based substrate, and a unique laminated canvas material Ñ are placed into an oven press and heated to 600-700 degrees under 35-65 tons of pressure. This causes the oil substrate to liquefy with the laminated canvas and fill the cracks and crevices on the mold. The artagraph is immediately shock frozen with liquid nitrogen leaving a permanent surface texture. These terms were originally used to distinguish the earliest stages of the prints for inspection purposes. Today, they are often applied after the entire edition has been produced. In many instances, an entire edition is divided into several limited categories and often the terms "AP" or "PP" are used to denote separate categories within the edition. "AP" is a print made for the artist's personal use, designated as such, and not part of the edition of that print. Atmosphere around the world varies widely in its chemical content. Locations like Denver, Los Angeles, and Mexico City are examples of atmospheres with a higher acidic content than areas such as Seattle or St. Louis. Coastal communities may have atmospheres more alkaline in content. An alloy traditionally composed of copper and tin. Bronze is of exceptional historical interest and still finds wide applications. It is harder than copper, more fusible, and easier to cast. It is also harder than pure iron and far more resistant to corrosion. Bronze sculptures are created through an indirect process. Wyland designs the original artwork in wax or clay, then a fine art foundry reproduces it using a multi-step procedure called "lost wax" investment casting. Each sculpture is constructed individually and each step, including molding, pattern making, investment, pouring, tool, assembly, and patination, is done by hand. Just one bronze casting can command the attention of up to a dozen skilled artisans and can take several weeks for the art foundry to complete. Successful sculptors are generally considered experts in the form, detail and behavior of their subject. This expertise is evident in their work, as the subject is recreated in a way that is both accurately portrayed and artistically appealing. A form of drawing that is executed entirely with brush and usually in a wash. It is the favorite technique in Oriental painting. In the process of creating a bronze sculpture, a wax reproduction of the original clay sculpture is covered in a rock-hard ceramic casting shell or "investment." When the wax has been melted out, the shell will serve as a mold for the molten bronze. When the bronze has hardened the shell is carefully broken away and cleaned from the casting. Channels through which the bronze was poured, called "sprues," are cut off and all parts are sandblasted to prepare for reassembly. A method of finishing bronze casts by removing small imperfections and smoothing rough spots. Often, the metal surfaces are embossed, hollowed, or engraved with steel tools to recreate the artist\'s subtle surface texture. Cibachrome is a color print material that allows high-resolution printing directly from color transparency film, slides, or digital files, and eliminates the need for costly, time-consuming, and resolution-robbing inter-negatives. These extremely fade-resistant prints offer first-generation sharpness, are generally glossy in finish, but can also be matte, depending on the artistÕs preference. For a more textured appearance, the artist can paint highlights directly onto the print by hand. This additional work often makes the print more unique in the eyes of collectors. Commission an original Wyland of your choice. By following a guideline description, you can choose the type of painting you want, including the colors and types of marine life. You can even specify the setting: an open ocean piece, above and below, or with reef. 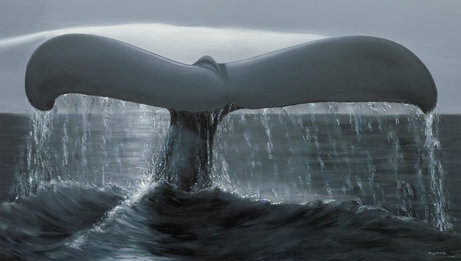 Wyland is well known as a Conservation Artist. When denoting separate categories for Limited Edition Prints, such as Artists Proofs or Printers Proofs, Wyland will occasionally denote a Conservation Copy category. The process of dewaxing a cast of a sculpture best defines the term "lost wax" casting. This occurs when the dried ceramic shell, still containing the wax pattern, is placed with its opening down into a hot kiln. As the temperature rises, the wax melts and flows out of the shell leaving a cavity in the form of the artwork. Dibachrome is the highest quality digital reproduction created from a high resolution scan of the original art. Printed on high quality glossy photo paper with you UV laminate to insure the longevity of the pigmented inks up to 75 to 100 years the life expectancy of the inks. Mounted to an archival board which has a shelf life of 200 years. . For a more textured appearance, the artist can paint highlights directly onto the print by hand. This additional work often makes the print more unique in the eyes of collectors. thanks. A painted or carved work in two parts or panels arranged side by side. The total number of prints produced from a single master comprises an edition. Describes the categories of art works that are traditionally considered aesthetically significant. They include architecture, painting, sculpture and many of the graphic arts and are contrasted with decorative and applied art, in which function is as important as aesthetic considerations. The finished wax version of a sculpture is prepared for ceramic investment by attaching a plumbing system of wax called "gates" or "sprues." The gates and sprues form the channels through which the melted bronze will travel to the artwork. Later in the casting process, the space occupied by the gates and sprues become runways through which the metal flows and trapped gas escapes. A giclee print falls between a serigraph and a lithograph in both quality and economy. The French word "giclee" literally means "to sputter." The ink jet printer and its proprietary ink / ink calibration system result in virtually continuous tone prints. The combination of specially-formulated inks and a unique pre-print system produces an unquestionably high-quality print. Canvas and somerset watercolor paper are the most popular of printing surfaces for this method. Unlike the more traditional printmaking techniques which use pigments, prints are made from dyes with up to 30 times more longevity than their traditional counterparts. Occasionally an artist hand-signs multiple prints. Hand signed does not mean the act of leaving an impression of the artist's name upon the print by any mechanical process. Originally this term was applied to prints in the edition which the artist, printer or publisher intended to withhold from the sale at the time the edition was produced. Today, this term may be used to identify a sub-category of a completely produced limited edition, which may be available for immediate sale. Humidity is the percentage of water content in the air and is an important contribution to patina development. All bronze is microscopically porous. Therefore, it takes on a certain amount of air. This air will contain the ambient humidity or water. A humidity swing is the rise and fall in humidity in a 24-hour period. Impressionist painters analyzed the effects of nature with devoted intensity. They devised a spectrum palette and relied on optical mixing to capture the impression of light at a given moment. Investment is the process of building a ceramic shell around a wax replica of an original clay sculpture by dipping the sculpture into a pancake batter-like mixture of slurry and sand. Between coats the shells are suspended in drying racks in environmentally controlled rooms. The process is repeated up to a dozen times, beginning with fine slurry and fine sand to capture surface detail and graduating to coarser coats for strength. A limited edition is created when a finite number of reproductions are made from a single master image. These editions usually bear numbers or markings to indicate the maximum number of allowable prints. All images in the limited edition are generally hand-signed in graphite by the artist and numbered. This signifies the artist\'s approval of all aspects of the creation and quality of the image, including execution and production techniques of the master and proofs. The image on the master also exists as an original painting or sculpture. The printer and / or casting foundry are asked to destroy the master plates and casting molds so no other proofs or editions can be created. Wyland has enjoyed publishing a series of limited edition prints over the years. After completing the original painting in oil, watercolor or other medium, he decides what printing method would create the best possible reproduction of the original piece. Some images are created in several different print mediums and sizes. Wyland\'s limited editions have been enthusiastically collected throughout the United States and forty countries around the world. Today he is recognized as one of the most popular and collected artists of our time. (Cire Perdue) A casting wax process using a wax model that is encased in a molding material, such as sand or plaster, then melted away, leaving a hollow mold into which the molten metal is poured. A harmonious blend of precious metals is combined with hot-torched acid patinas embedded in Lucite¨, an acrylic polymer, that is clear which adds rich color and texture. Originals arrive at a foundry in the form of plastiline-the result of sculpting, and resculpting, soft clay. From these originals, first-generation models are created. Each sculpture is sectioned into a myriad of component parts and placed into molds for the creation of individual cavities. Once these metals have solidified in the molds and are released, the component parts are welded together to form the final shape of the sculpture. Meticulous hand work with fine stainless steel tools recovers detail lost in the welding process. At that point, each original sculpture is bathed in hand-applied precious metals and various patinas. In finishing the sculpture is hand-relieved with a combination of steel wool and sand to release the color and texture of the original metal form. In its final stages, the metal castings are embedded into the Lucite¨. Once the Lucite¨ is baked and cured, its texture and visual appearance is very rough. Hours of painstaking hand polishing is then put into making the Lucite¨ crystal clear. A master is any printing plate, block, screen, or similar matrix that contains an image used to produce a print multiple. Any particular material used by an artist: oil paint, clay, ink, pastel, wood, concrete, or bronze. A combination of various graphic techniques applied to one print. A blend of precious metals is combined with hot-torched acid patinas. Originals arrive at the foundry in the form of plastiline-the result of sculpting, and resculpting, soft clay. From these originals, first-generation models are created. Each sculpture is sectioned into a myriad of component parts and placed into molds for the creation of individual cavities. Once these metals have solidified in the molds and are released, the component parts are welded together to form the final shape of the sculpture. Meticulous hand work with fine stainless steel tools recovers detail lost in the welding process. At that point, each original sculpture is bathed in hand-applied precious metals and various patinas. In finishing the sculpture is hand-relieved with a combination of steel wool and sand to release the color and texture of the original metal form. A mold allows wax replicas to be made of an original clay sculpture and makes possible the casting of limited editions. To construct the mold, a molding compound is painted or troweled onto the original and built up until it is a thickness that is durable yet retaining flexibility. Molds are usually made of flexible rubber or silicone and can be used for the entire limited edition. A rigid support of plaster or fiberglass called the mother mold is built over the finished rubber mold. The outer mold helps the rubber retain its shape and position and allows the mold to be handled. A large painting or decoration applied directly on a wall surface or completely separated and later affixed to it. Wyland is recognized as a master muralist and has completed 100 of his renowned Whaling Walls around the world. When denoting separate categories for limited edition prints such as an artist's proof or printers proof, a category is sometimes denoted as museum proof. A limited edition is denoted a museum proof if a museum is, in some way, involved with the art. Numbered prints have become an established custom. Two numbers such as 3/99 are written in pencil in the lower margin of a print. It is sometimes mistakenly assumed that the lower the number, the better the print. Although this may be true of dry point prints because the burr may wear down, it is not necessarily true of all prints. First, the prints may not have been signed in the order they were printed. Prints are not normally signed until the entire edition is printed, dried, trimmed, and stacked, and it is difficult to always handle the prints in the order they were printed. Secondly, as in any new project, the printer does not always learn to get the most from a plate until he has done several prints. Therefore, it is quite possible that the higher number prints are the "better" ones. The print number has little significance beyond the indicated the maximum edition of prints. It should also be noted that, although the bottom number indicates the maximum number of prints that may be pulled, it does not necessarily mean that they were all printed. Offset lithography is a modern version of the old stone lithograph technique. Today the image is rendered photographically onto metal plates and treated so that only specific areas will retain the color. Next the paper is run through the press that picks up a different color at each plate. All Wyland offset lithographs are printed on the finest 100-percent acid-free paper the highest quality printing photomechanical process available. With offset lithography, there is virtually no variance from the first print or the last. In contrast, the old stone lithography method exhibits a good deal of variance between prints, with later prints losing definition. NOTE: Wyland Galleries does not sell original lithographs. Our offset lithographs are signed and numbered by Wyland and accompanied by a certificate of authenticity. A type of paint made of pigment mixed with a drying oil such as linseed oil. Refers to works considered to be authentic examples of the works of an artist or epoch, rather than reproductions or imitations. All original watercolors by Wyland are painted on 100 percent rag paper. Offset Lithographs are printed on 100 percent acid proof paper. A patina is a chemical coating that adds a colorful finish to metal sculpture. This is a particularly effective treatment for bronze, which can be given a wide variety of attractive green, brown, blue, and black patinas. Natural patinas, like the creative element of fine art, have a degree of serendipity. That is probably why artists and collectors for 500 years have cherished works of art with rich and deep patinas that developed over time. Art consultants may not be able to predict with exactness the rate which natural patinas develop but they can be knowledgeable about the factors that contribute to change: atmosphere, temperature and humidity. An impression or proof taken from any master block or plate that has been prepared for that purpose. A reproduction made from a single master image. A small sketch that an artist paints or draws in the margin of a print, generally near his penciled signature. The print is often an offset reproduction, but the artist's sketch, added after the fact, is an original. Historically, a "remarque proof" was the result of the artist's habit of trying the etching needle on the margin of the copper plate. By the 19th century, however, marginal markings were added intentionally to give the buyer an even more unique item. Remarques are a bargain when available, since few artists do them; primarily because they are time consuming. Serigraphy, also called silk-screen printing, is a printmaking technique based on stenciling. First, images are stenciled onto a screen with the aid of photosensitive emulsions. Every different color, even slight shades of blue for a sky or green for leaves, requires a new screen and a pass of color. Next, the screen is positioned over high-quality acid-free paper. A squeegee pushes paint through the portions of the mesh that are not blocked by the stencil. The paint is applied one color at a time, usually the light colors first, followed by the darker colors. Then the print is laid to dry. Generally, only one color a day is printed. Most artists today sign their prints in pencil. The signatures have come to stand for, among other things, a stamp of quality and the authenticity of the print. It would therefore be improper for an artist to sign a reproduction unless it is clearly marked as such, or to sign inferior prints that do not meet the artistÕs standards. All impressions pulled from an unaltered printing surface are referred to as "states." Several states of the same print may be produced when the artist makes changes in the block or plate. A series of paintings, drawings, or prints linked by a common theme. Sometimes called "masterchrome" or "chromograph," supergloss prints are exposed directly from transparencies onto an extremely durable polyester-based material. Like a Cibachrome, this process eliminates the need for time-consuming, costly and resolution robbing inter-negatives. Maximum color saturation is achieved, while contrast problems inherent in other materials are minimized. Prints are generally glossy or matte, with longevity that rivals Cibachrome. Originally a literary movement in the 1920s, surrealism incorporates stylistic and theoretical aspects of cubism and Dada. Seeking to reveal the reality behind appearances, especially in a psychological sense, surrealism draws heavily on Freudian theories about the unconscious, dreams, irrationality, sexuality and fantasy. Hence, the use of dream imagery, automatism and symbolism. An important factor in the aging of natural patinas is temperature or the temperature swing. For example, the temperature cycle of Tucson, Ariz., may vary 40-50 degrees in 24 hours, while other parts of the country may be stable from season to season. These fluctuations Ð or lack thereof -- can affect the appearance of a patina. A painted or carved work in three parts or panels arranged side by side. Artists may make a Cibachrome or Repligraph "unique" by adding hand-painted highlights. This also gives the reproduction a more textured appearance. Vehicle material binds and carries pigments in suspension, most commonly gum and water, water and egg yolk or oil. Water colors contain pigment pulverized with a water-soluble binder, such as gum arabic, that is dissolved in a water vehicle. The paper in this transparent technique supplies highlights. Wax replicas (called wax patterns) of an original clay sculpture are made by filling a mold with liquefied hot wax then rotating the mold until all cavities are filled. Next the wax is poured out, leaving a thin skin on the interior of the mold, one-eighth inch to three-sixteenth inches thick. When the mold is pulled away, a hollow wax replica of the original artwork is revealed. The hollow wax patterns are tooled to correct all wax pouring imperfections, refined details, and smooth surfaces. The artist will sometimes oversee the work of the artisans in this stage. Larger sculptures are often cast in a number of sections then reassembled by welding the pieces together. The welds are ground down and textured to match the surrounding surfaces making the seams unnoticeable. In the finishing stage, artisans and metal workers use a variety of hand and power tools to achieve or refine final surfaces and accentuate textures. Our new, high-gloss WylandChrome process allows incredible color fidelity and digital reproduction so precise that print number 2,000 is just as crisp and bright as print number one. WylandChrome uses no chemicals, is fade resistant and archival for more than one hundred years. Best of all, the resilient protective properties of this environmentally friendly process make glass framing unnecessary. To clean the print, just wipe the surface with a soft damp cloth.